July 27, 2012 - Air Force Chief of Staff Gen. Norton Schwartz said the Air Force has data indicating the cause of the F-22 Raptor's hypoxia-related incidents stem from the quantity, not the quality, of oxygen available in the cockpit. "Given tests in the altitude chamber and the centrifuge, we have confirmed that there is a combination of hardware-related items that have created breathing problems for our pilots," Schwartz said. A valve in the upper pressure garment worn by pilots during high-altitude missions was causing the vest to inflate, and remain inflated, resulting in increased pressure on the pilot's chest, he said. The Air Force will replace the upper pressure garment vest valve. Additional measures to improve airflow include the April decision to remove the C2A1 filter, which was previously used to test for contaminants in the cockpit, as well as future efforts to explore improving the oxygen delivery hose and its physical connections, he said. "We have a deliberate plan underway now both to modify that equipment, to test that equipment under the most demanding conditions, and that will begin to hit the field in September," Schwartz said. "Given the limitations the Secretary of Defense has imposed until those improvements are fielded, we are confident that we have managed the risk associated with continuing operations in the F-22." Schwartz said the Air Force will continue updating Defense Secretary Leon Panetta to demonstrate the results of the improvements. In May, Panetta directed the Air Force to limit all F-22 flights to remain near potential landing locations to enable quick recovery and landing should a pilot encounter oxygen deprivation. The secretary also directed the Air Force to expedite the installation of an automatic backup oxygen system in all of the planes, and he asked for monthly progress reports as the service continued the search for the root cause of the problem. These actions were in addition to steps the Air Force already was taking to determine the root causes of the hypoxia-like symptoms that some pilots experienced. 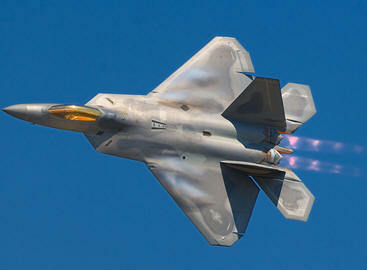 Following an Air Force briefing last week, Panetta decided to gradually lift restrictions on the aircraft. He authorized the Air Force to deploy a squadron-sized element of F-22s to Kadena Air Base, Japan, via the Northern Pacific transit route, Pentagon Press Secretary George Little briefed reporters earlier in the day. Schwartz said the Air Force will take proactive steps for the deployment, to include placing an F-22 pilot on the tanker accompanying the fighters so that a Raptor expert can offer advice as needed in the immediate vicinity of the deploying aircraft. "The tanker will have sufficient fuel aboard should the formation need to descend to a lower altitude to make its destination," Schwartz said. "These are the kinds of prudent aviator risk management actions that we're taking for this deployment." Initial long-duration flight routes will be designed to pass near airfields. The Air Force also has imposed an altitude restriction on the aircraft so pilots will not need to wear the pressure vest. Training sorties will remain near runways until completion of the Air Force Scientific Advisory Board-recommended corrective actions expected by the end of the summer. The Air Force will notify Panetta when fixes are in place for the pressure vest and related cockpit life support components. Pending successful completion of associated testing and NASA's independent analysis, Panetta will consider returning the F-22 fleet to normal operations. The F-22 aircraft have flown more than 7,000 sorties, accumulating more than 9,000 hours since the last unexplained incident involving hypoxia-like symptoms occurred March 8.